A rocket carrying a satellite set to be launched from Vandenberg Air Force Base was scrubbed Saturday night due to technical issues. LOMPOC, California -- A rocket carrying a satellite set to be launched from Vandenberg Air Force Base was scrubbed Saturday night due to technical issues. The United Launch Alliance rocket was scheduled for 8:15 p.m. and with only 7.5 seconds left before liftoff, a hold was placed. It appeared there may have been problems with the fuel and after the delay, the launch was scrubbed during the live broadcast. People flocked to Griffith Observatory in hopes of catching a spectacular light show in the sky from the rocket, but were ultimately disappointed when the launch was canceled. ULA said the sequencer, which controls the countdown detected a problem, but specifics of what else went wrong were not given. It was originally scheduled to launch Friday afternoon, but the attempt was scrubbed after issues between the control center and the launch site. 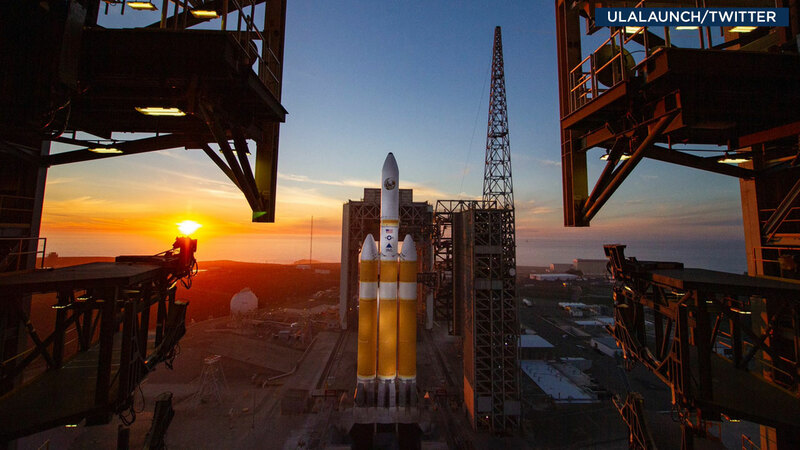 ULA shared a picture of its Delta IV Heavy rocket as it gets ready for launch from Vandenberg Air Force Base on Saturday, Dec. 8, 2018. The rocket, a Delta IV Heavy, was carrying a government reconnaissance satellite.